Let’s Get Practical With Money! Listen to Mary Hunt on Focus of the Family! Money without a doubt is a major stress factor for single moms. Actually, money management can be challenging for everyone. Those challenges include debt, saving money, managing money, spending money, not having enough money and the list goes on. One of my biggest issues with money is saving it due to having to pay such a large amount in rent. It is something that settles uneasily in the back of my mind and isn’t easily resolved since I live in a state where the cost of living is ridiculously high and unfortunately moving would be difficult because of Anya’s routine. So, for the time being I am trying to make the best of it and find other ways to save a dollar. Focus on the Family has a number of informative broadcasts that I often listen to and yesterday, Mary Hunt was on discussing how to Avoid Common Financial Mistakes. If you have some extra time, listen to this broadcast. She gives some practical information on finances that I think anyone would find helpful. Mary Hunt at one time had her own financial problems, she was was over 100k in debt. It took her 13 years to pay it off with hard work and also a lot of prayer. Her story will motivate and encourage you.She also talks about giving back which I think is key to successful money management. My hope is to come to a point of financial security where I can give back comfortably and generously, isn’t that the purpose of money? Let me know your thoughts on the broadcast and some of your own money saving tips. Click on Focus on the Family Broadcast to listen to the broadcast. Back to School Sales! Every Penny Saved Matters! 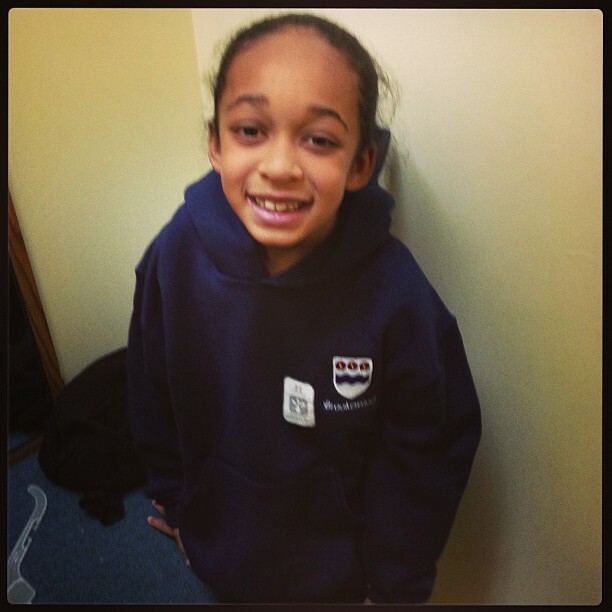 Anya proudly displaying her new school’s sweatshirt! August is here and it is BACK TO SCHOOL TIME! I loved buying school supplies and getting ready for the brand new school year when I was a kid and I am still excited as a parent for my kid!! Here are a few deals to check out to save some dollars! Check out this link for Sales Tax and Holiday Cuts. There are still a few states that have deals going on for a tax free weekend on back to school shopping. Certain restrictions do apply so read the fine print for your state. Passion for Savings is a great website with tons of resources on savings and coupons! Walmart has some great sales for back to school shopping with discounts as low as .97! Target sales via Passion For Savings– 2 Pocket Folders for 15 cents and 8# 2 Pencils for .47 cents! Kmart Sales via Passion for Savings– Composition books as low as 25 cents! Shop around and think about buying in bulk with a friend and split the costs. Every penny matters! Take time to visit Passion for Savings it is an incredible resource for savings and coupons! Happy School Shopping!